Most animals have some way to protect themselves against enemies. The frilled lizard has one of the most creative protections. This little lizard opens up a frill around its neck to make it look big and scary. It might open its mouth and hiss. But if these tactics don’t work, the lizard turns tail and runs to the safety of a tree. All About Frilled Lizards: The frilled lizard has one of the most creative protections. This little lizard opens up a frill around its neck to make it look big and scary. 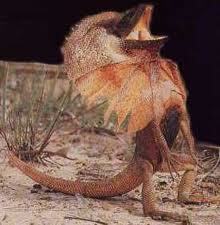 Frilled lizards live in Australia. Even the largest lizards are less than 3 feet long and weigh about 1 pound. Frilled lizards eat insects and small animals. They spend most of their time in the trees, where they’re safe. The frilled lizard is sometimes called the bicycle lizard. This is because it runs on its hind legs when it is scared. Most frilled lizards are less than 12 inches long. An open frill stretches from 9 to 14 inches wide, making it at least as big as the rest of the lizard. Frilled lizards lay tiny eggs in a nest in the ground. The newborn babies can take care of themselves. Frilled lizards stand on their back legs when they raise their frills to scare another animal. Frilled lizards stand on their back legs when they raise their frills to scare another animal and that’s not all about frilled lizards. Main Body Parts all about Frilled Lizards. 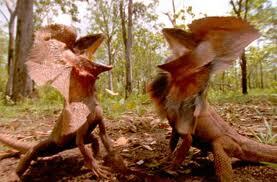 A video documentary about frilled lizards fighting for territory. Question: Are frilled lizards venomous? Answer: Frilled lizards are all bark and no bite. They are not venomous and are not dangerous to humans. Unless you’re a bug or a small animal, you have nothing to fear from a frilled lizard. Question: Are frilled lizard eggs soft or hard? Answer: Frilled lizard eggs are soft. Enjoyed the Easy Science for Kids Website all about Frilled Lizards info? Take the FREE & fun all about Frilled Lizards quiz and download FREE Frilled Lizards worksheet for kids. For lengthy info click here. Declan, Tobin. " Frilled Lizards Facts for Kids ." Easy Science for Kids, Apr 2019. Web. 23 Apr 2019. < https://easyscienceforkids.com/all-about-frilled-lizards/ >.